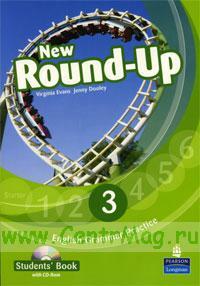 New Round-Up 3 English Grammar Practice combines games and fun with serious, systematic grammar practice. It is ideal for young learners in the preliminary stages of English language learning. Students see grammar points clearly presented in colourful boxes and tables. They practice grammar through lively, highly illustrated games and oral and writing activities. New Round-Up is especially designed for different students studying English in different ways. - in class with a coursebook. Students do both oral work - in pairs and in groups - and written work in New Round-Up. - after class. The 'write-in' activities are ideal for homework. Students can practise what they have learned in the classroom. - in holidays for revision. New Round-Up has clear instructions and simple grammar boxes, so students can study at home without a teacher. The New Round-Up Teacher's Guide includes a full answer key, quizzes, tests plus answer keys, and audio scripts of progress check listening tasks. CD disk to provide more grammar practice and games.